HOUSTON (May 21, 2018) – At this year’s Offshore Technology Conference (OTC) Distinguished Achievement Awards Luncheon, Cesar Del Vecchio, Ph.D., a Senior Staff Consultant at Stress Engineering Services, was presented with the prestigious Heritage Award. 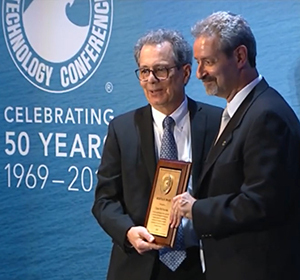 Dr. Del Vecchio received the Heritage Award for his contribution to the safe and economic development of deepwater floating systems by establishing, proving, and gaining worldwide acceptance for the use of polyester mooring systems. His initial research in replacing all steel catenary systems with synthetic taut moorings is considered a breakthrough for floating production system technology by extending the range of moored floaters into deep and ultra-deep water, while reducing seabed footprint. Dr. Del Vecchio led Petrobras’ effort that used a full life cycle approach to design systems. Some of these systems have now been in service for more than 20 years. As an employee of Stress Engineering Services, he continues to use his widely recognized experience with the integrity management of mooring systems for a variety of clients. The OTC Distinguished Achievement Awards Luncheon recognizes the OTC Distinguished Achievement Award recipients, raises funds for a worthy cause, and provides an excellent opportunity for industry leaders to network with colleagues from around the world. This year’s event was held on Tuesday, May 1 at NRG Center in Houston, Texas as part of the annual conference.